We commend you for taking the time to research what could be one of the most rewarding aspects of your son’s college experience: fraternity life. Your dedication is a large part of why your son made it to college and is now seeking new challenges. For that, we thank you. We understand that your son’s personal development, academic achievement, and personal well-being are first and foremost on your mind: we feel the same way. Sending your son to a four-year institution presents new challenges. Our fraternity supplements your family and will help your son as he grows through his formative college years and beyond. Through these challenging times, Lambda Phi Epsilon will serve as both a reliable foundation to lean on and a community to nourish your son’s growth. When it comes to family, we want the best for those we care about most, just like you do. After college, our fraternity will provide your son with a lifetime network of support that will help him make his parents proud. Lambda Phi Epsilon has helped thousands of men on their quest for authentic manhood. Please read below to explore main areas of development for brothers of Lambda Phi Epsilon. Lambda Phi Epsilon believes that academics must be a top priority for our members. Our brothers continually encourage each other to greater heights in academics. In order to maintain membership in our organization, each member must maintain a minimum 2.5 grade point average. Each and every member works with one another to maintain and excel above each member’s stated goals, much in the same way that parents do back home. The fraternity mandates study hours, encourages academic mentorship, and rewards academically successful brothers with annual international scholarships. Academic excellence is a hallmark of our fraternity. Family is a quintessential aspect of Lambda Phi Epsilon. The fraternity provides a sense of community and connection like no other structured organization in the world. Many of our members’ parents are first or second generation immigrants. Our parents hope that their children will have opportunities in life that were not available to previous generations of immigrants. The opportunity to grow and prosper here in North America is precious. As we all know, a successful college education is an important part of that. We provide a family away from home that will support and nurture all members throughout their school years and beyond that. As an organization, Lambda Phi Epsilon will provide your son with familial support that each and every member can rely on in both their academic and personal lives. 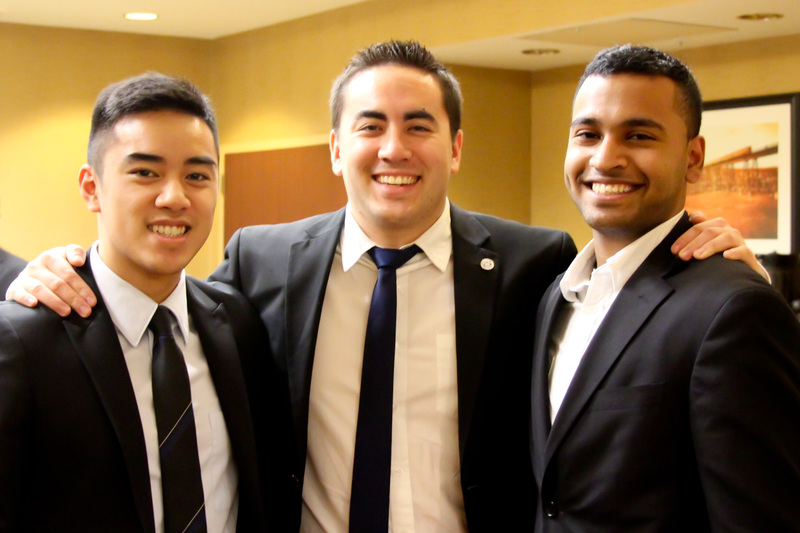 Building a professional network is something that our brotherhood can help with during and after university study. Your son will join Lambda Phi Epsilon during his collegiate career, but the network, community, and relationships that he builds will endure for life. Professionally, Lambda Phi Epsilon’s 10,000+ alumni, located around the world, are eager to provide your son with employment opportunities and advice in every field imaginable. Since we are a fraternity that values leadership skills, you will find that many Lambda brothers are professionally successful and eager to share their experiences with younger members. Within the home campus of each Lambda Phi Epsilon chapter, fraternity members are encouraged to do more than just participate in school activities. Across the continent, brothers of Lambda Phi Epsilon regularly serve as presidents, founders, and leaders in student organizations of all kinds. During our International Convention, undergraduate members and alumni alike come together to learn how to become a better Lambda Man. At semi-annual regional events, all fraternity members attend personal and professional development seminars, workshops, and discussions. More importantly, our fraternity provides training and skills to develop the skills that will be used for professional as well as personal development. Lambda Phi Epsilon will encourage your son to think critically, to dream big, and to work hard. We strive to help every member continue his growth into a man of character and distinction, a path that you, as parents and guardians, first set him on. We want to help him become a Leader Among Men, just like you do. So tell him to find us. We are waiting anxiously just as you are, to see what he can become. What are the benefits of joining Lambda Phi Epsilon? What are the expenses associated with being a member of Lambda Phi Epsilon? Brothers of Lambda Phi Epsilon are required to contribute dues towards funding their organization’s activities. Lambda Phi Epsilon dues at our member chapters vary by chapter but are all traditionally well below the $605 average for semesterly fraternity dues nationwide. How will Fraternity life affect my son’s grades? Lambda Phi Epsilon emphasizes academic achievement for all of its members. The fraternity will support your son through any academic hardship with mentors, guided study hours, and removal from fraternity activities, if necessary. Why should I let my son join Lambda Phi Epsilon or any fraternity or Greek-letter organization? Greek-letter organizations are groups of like-minded individuals with similar values and aspirations brought together by time-honored rituals. Studies have shown that members of Greek-letter organizations graduate with higher GPAs and at a higher rate than non-Greeks. A large percentage of US Senators, Presidents, and Fortune 500 CEOs were members of Greek-letter organizations. Joining a Greek-letter organization provides proper footing and access to an established professional network, all of which leads to more satisfied students and involved alumni. What is Lambda Phi Epsilon’s policy on hazing? Lambda Phi Epsilon has a very strict no hazing policy. No Lambda Phi Epsilon chapter, colony, student or alumnus is permitted to conduct or condone hazing activities.